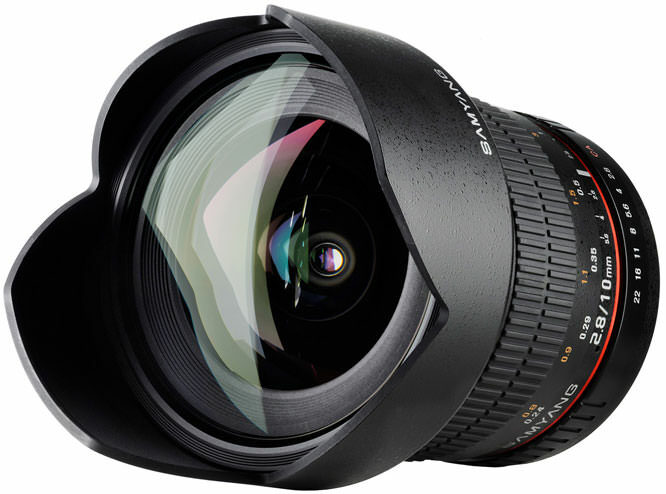 Samyang has released a new wide angle 10mm f/2.8 lens. Samyang has introduced a focused development program to obtain the highest possible optical parameters and reduce the product's size at the same time. These efforts resulted in the latest version of the Samyang 10mm f/2.8 ED AS NCS CS lens featuring parameters and capabilities comparable to the best wide-angle prime and zoom lenses on the market. The new Samyang 10mm f/2.8 ED AS NCS CS is an ideal tool for indoor, architecture and landscape photography. It provides an exceptionally wide field of view of up to 109.5 degrees and rectilinear image mapping function. Owing to a fast f/2.8 lens speed you can also use the lens in low light conditions as well as sports photography and photojournalism purposes. The product's optics comprises 14 elements divided into 10 groups, this includes 2 aspherical AS lenses and one lens made of extra-low dispersion glass. The Samyang 10mm f/2.8 ED AS NCS CS is the first Samyang Optics lens to feature a nano crystal anti-reflection coating system. This technology provides a lower reflection factor than (U)MC system as the coating is now applied more evenly on the surface of the lens. Benefits brought by the nano crystal layer include better light transmission, increased resistance to reflections and higher contrast, and all of this translates into supreme optical resolution of the lens. The lens will be available from the end of January 2014. The suggested retail price for the Nikon version is £469.99 inc VAT. All other fittings carry a suggested retail price of £429.99 inc VAT. For more information, take a look at the Samyang website.